I think I have found the best burritos in the world! Indian-Mexican fusion. Avatar’s Punjabi Burritos in Mill Valley is the sister restaurant to Avatar’s restaurant in Sausalito. 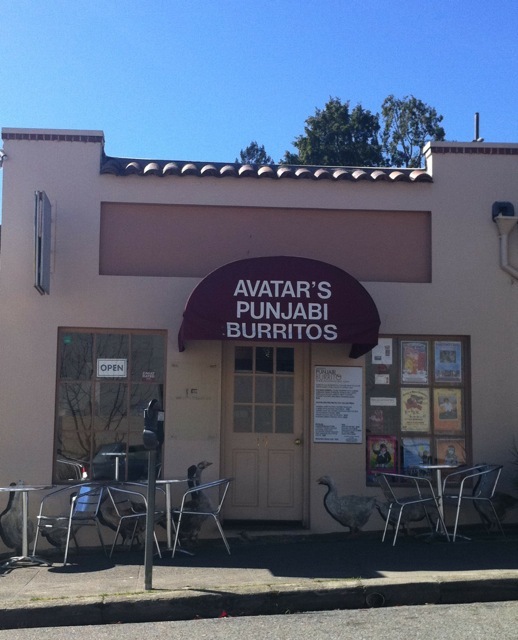 Avatar Punjabi burritos are my new obsession. I like a place that makes it easy to figure out what you want. Today I ordered the Curry Chicken burrito. Total cost $8.00. It’s big enough that Celia and I can share one and be satisfied. This place could be described as a hole in the wall. I’ve walked past Avatar’s a million times and never tried it. Take a lesson from me, don’t hesitate to try a hole in the wall kind of restaurant… sometimes you discover the most amazing food and people. Avatars is a great place to stop after a hike or bike ride in Mill Valley. As you know, I live in Mill Valley and like you, have passed this restaurant many times. I did walk in once several months ago to request their take-out menu, but as of yet, have not ordered their food. Well, your review here has prompted me to revisit AVATAR PUNJABI. Will let you know as soon as I order and eat my first burrito. Sounds yummy! They’re really good! After you try them please leave a comment and let me know what you think.